Could the Future-Fit Business Benchmark be about to Shake up the World of Green Business Ratings? In January, we had the chance to catch up with two of the world’s foremost experts on business sustainability; Geoff Kendall of 3D Investment Foundation in the UK, and Canada’s very own Bob Willard, author of The Sustainability Advantage. We asked them about the world of sustainability ratings, the puzzle of measurement, and the initiative they’ve been pouring themselves into for the past year - a collaboration between themselves and The Natural Step Canada; the Future-Fit Business Benchmark. How is business sustainability being measured today? The first is relative to a baseline year. For example, a company may claim to have reduced its water use by 30% since 1990. This often sounds very good, but firstly you don’t know how bad they were in 1990. Secondly, you don’t know if they have just done some quick-win, easy things. So measuring relative to a baseline year really tells you nothing about how far a company has yet to go and whether it currently uses water sustainably. The second is relative to a company’s own short-term goals. A company may say that it’s going to reduce its carbon emissions by 30% by 2020. Again, that sounds positive, but really tells us nothing about the level those carbon emissions eventually need to get to in order to be sustainable. It also doesn’t tell us whether achieving the chosen goal by that date would actually be a stretch for that organization or whether they were going to do it anyway through year over year efficiency improvements. And the third approach - which is most common among sustainability rating bodies such as the Dow Jones Sustainability Index and many others - is to compare progress and performance relative to other companies, usually within the same sector. The challenge with this, of course, is that you might have an entire sector that is fundamentally unsustainable because its business model is harming society or the environment in some way. Companies within that sector, if you’re just measuring relative to each other, may end up with inflated ratings that don’t take account of the fact that the sector itself might be fundamentally unsustainable. A good example of this was the Dow Jones Sustainability Index, back in October, giving an oil company a score of 85%. In other words, saying that it’s 85% sustainable. Now, if we think of where we are in terms of greenhouse gas emissions around the world, and the way the oil sector currently works, then telling ANY oil company that it’s 85% sustainable is counterproductive and only propagating the business-as-usual approach of companies in that sector. This isn’t something specific to the oil sector. Anything that compares companies based on best practice is not telling us the whole story. At best it can only tell us who are the least worst of the companies currently operating. What sets the Future-Fit Business Benchmark apart from these approaches? Geoff. The difference is that the Future-Fit Business Benchmark measures progress relative to a definition of where all companies need to be in the future according to the best available science today. Wind a clock forward and imagine that we are now in a sustainable economy. What would we be able to say about all companies in that economy? What would be true of the performance of these companies in order for that economy to go on forever? That’s the starting point for the goals that constitute the Future-Fit Business Benchmark. 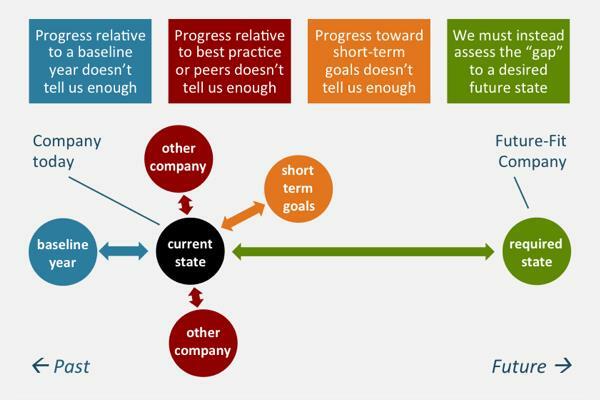 Rather than looking at current best practice and rewarding incremental improvement on the status quo, we look at necessary progress toward a required future state so that those companies - and investors in those companies - can see where they are today relative to where they need to be. Geoff. Given the scale and speed of the challenges we face, whether it’s around increasing inequality, climate change, water scarcity, rapid population growth, it’s simply not enough to be slightly better than last year or slightly better than your peers. What we need to do is understand the limits of the planet, and the maximum we can do in terms of our impact on the environment and society. We need to ensure that we’re living within those limits, and just as importantly, what constitutes a positive impact on those limits. How can we reduce the inequality, how can we start to slow the rate of climate change? How can we make sure that everyone is using only their fair share of water? All this becomes increasingly important as the population continues to expand. Given that for some of the world’s pressing problems we have already overshot the planet’s carrying capacity, it’s more essential than ever that we have a good yard stick by which to measure progress. Our interview with Geoff Kendall and Bob Willard will continue in Part 2 of this series: What makes a business Future-Fit? Visit futurefitbusiness.org to read and comment on the first Public Draft of the Future-Fit Business Benchmark.